A woman has suffered serious leg injuries after being hit by a car outside a primary school. Isle of Man Police said the 52-year-old pedestrian was struck by a blue Nissan Micra on Braddan Road in Braddan at about 13:55 GMT. The force said the woman had been taken to Noble's Hospital for treatment, while the driver of the car was unhurt. 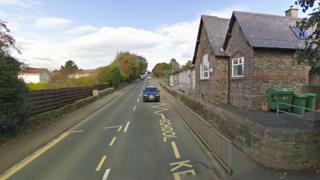 Police closed the road outside Braddan Primary School for two hours to allow an investigation to take place.